What Kate Baked...and baby! : I WAS THERE! BEING A CLOUD AT THE OLYMPIC OPENING CEREMONY!! I WAS THERE! BEING A CLOUD AT THE OLYMPIC OPENING CEREMONY!! After four months of rehearsals, countless hours moving Props in the pouring rain, unpaid leave from work, a fiance who has felt like an Olympic widower, being sworn to secrecy and mounting excitement. It was incredible. Goosebumps, gasps, a racing heart. And as I write I still can't believe I was there. It was one of the best nights of my life. There aren't enough adjectives to describe the night. And just a little surreal. Who knew at the start of the year I'd be telling you 'I was a cloud at the Olympic Opening Ceremony'?! That was me! I was one of the minders! Or, to give our official title a 'Cloud Wrangler'. Dressed in our fun white dungarees that I'm almost certain Stella McCartney had been no where near, we were the very first to head onto the Field of Play at 7.30pm. Watching the buzz building as the audience filtered in, admiring the beautiful rural scene on display and then transform into the dramatic, noisy, ugly industrial landscape. It was felt like a bizarre dream to be told at one stage over our radios: 'Could the Clouds be aware that the geese and cows are now exiting. Please could the clouds stay away from the animals'. And it was all a little emotional too: the children singing Bread of Heaven, the poignant minute of silence, the joyous celebration of the National Health Service. I arrived home, exhausted but elated at three o clock this morning and promptly watched the entire spectacle as seen by 1 billion people around the world. 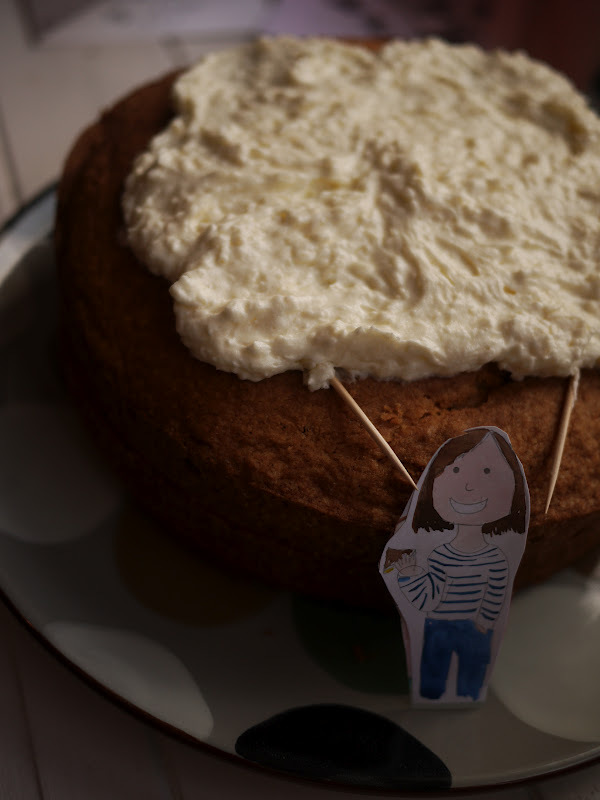 A cake version of me and the cloud! 7. To make the filling: warm the jam over a gentle heat in a pan, stirring gently throughout. Beat together the icing sugar, coconut and butter. Spread the cooled jam on the top of the bottom half of the sponge and use half the coconut buttercream to sandwich the two sponge cakes together. 8. 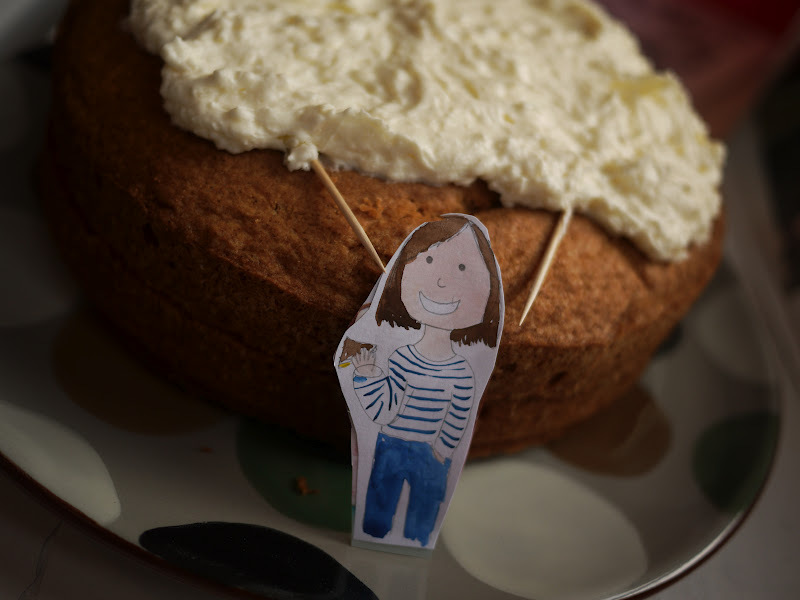 Decorate the top of the cake with the remainder of the coconut buttercream in the shape of an Olympic Ceremony cloud! Its taken me the best part of four hours to write this post as I keep stopping to pinch myself (its getting a little painful now)- I still can't believe I was there! Ban-Ki Moon said thank you to me as I held open a curtain! Bring on the Closing Ceremony... rehearsals continue tomorrow! We are so proud of you honey... I knew you were there and I told all my friends that I knew someone there... and a very small part of me suspected you'd be one of the Cloud Wranglers!!!... It was an excellent show and you should feel utterly full to the brim with pride for being part of it... bloody genius!!!!!!!!!!!!!!!!!!! Aaawww Kate, thats brought a tear to my eye, how amazing for you, a memory to treasure forever. It was such an amazing show - you must be so very proud to have been an actual part of it. We watched, shouted and screamed at the top of our voices, danced, sang and waved LED lights from the crowd! An awesome experience. I can't even begin to imagine how hard you all worked to rehearse all of that - mind blowing! Wonderful post, so glad you had fun! There was me looking out for you in the nhs section. Well it was an amazing performance and so good to hear that you had so much fun taking part, well done to you and thanks to you and all the folks involved for putting on such a memorable show. Well done you! Great job. They were supremely well wrangled clouds. Last night was the first and only night ever I've regretted not having a TV here in France, it all sounded so fantastic, I'm so glad you had such a splendid time, well done. How exciting! You Brits are doing a great hosting job!! Cloud wrangler - wow. YOu should have business cards made up! How lovely to have taken part - congratulations on all your hard work. Fantastic! How exciting! Great job title and I love the dungarees. I managed to get last min tickets in the standing pit and I saw all the cloud wranglers so I must have seen you. It was such a great show, it must have been fab to be part it of! It's so great that so many people were happy to take unpaid leave and put in so much time for it. Well done you!! How amazing !! We missed the event on Friday so watched it last night in i-player - I didn't spot you but it's lovely to think I "know" someone who was in there somewhere !! I thought the green and pleasant land turning into the industrial bedlam was the best bit of the whole thing. congrats......thats absolutely awesome!!!!!! !an experience of a lifetime! What an amazing experience! Something to remember for ever. I love the coconut cloud cake to celebrate, such a lovely idea.